If you are looking for information on the Granite Shield franchise business opportunity, Granite Shield Countertops franchises or Granite Shield franchising, then you have come to the right place. Granite Shield Countertops and Granite Shield are a division of Sealing Technologies Management Incorporated which has been a licensed contractor for kitchen cabinets and design since 1982. Granite Shield is the industry leader in natural stone sealing and protection with a lifetime warranty on granite since 2002. Granite Shield Countertop stores are a turnkey investment for any entrepreneur wanting to own their own business without the risk of going it alone. For their investment they will receive stock options plus profit sharing. They will receive a retail showroom complete with inventory, computers, software, samples and displays. Investors can manage their own stores or sit back and let Granite Shield Countertops Incorporated take care of everything. Granite Shield Countertops features lifetime warranted, maintenance free prefab and custom granite, new cabinets, refacing of cabinets, sinks, faucets, appliances, natural stone flooring, sealing services and restoration services including marble honing, polishing, products to maintain natural stone, kitchen and bath remodeling. Granite Shield currently has a service network in 45 states and England and Ireland. 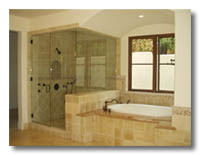 The Granite Shield process was invented by Granite Shield and is exclusive only to Granite Shield. Granite Shield is the only lifetime and maintenance free sealing process available with less than a 1% failure rate. 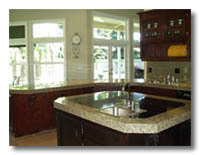 Granite Shield Countertop Stores also offer after market services. With all of the natural stones, glass, stainless steel and grout being used in today's homes, maintenance for consumers has become one of the biggest issues. 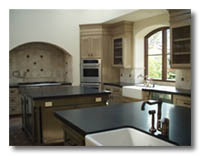 Granite Shield provides a sealing and warranty service to address these issues. With our permanent, lifetime warranted, one time sealing process on granite which makes the stone smoother with a deeper shine, glass sealing technology which reduces water spotting and keeps shower doors cleaner longer, and floor and wall sealers for natural stone, porcelain, ceramic and grout in showers and the rest of the house to keep water from penetrating and stains from forming with a 10 year warranty. Our stainless steel cleaning and sealing system removes the oxidation and reduces fingerprinting and streaking making stainless steel easier to maintain than ever before. After flooring is sealed by an Authorized Granite Shield Applicator a monthly cleaning with our after care cleaner Kleen n Seal will rejuvenate the floor sealer keeping floors clean and sealed for life. With Granite Shield Countertop Incorporated trained personnel will be supplied for each store with complete management training. Management team are experts in related business and position. Consumers would rather buy natural stone over artificially made products but have always shied away due to the high maintenance requirements. Granite Shield Countertop stores eliminates this concern increasing consumer confidence. Retail locations generate walk in traffic with national and local advertising supporting all locations.